The K008 is designed for powerhouse performance in the most confined areas. The compact size and maneuverability combined with the power it possesses enables it to be productive where larger equipment would be too large and heavy. Equipped with rubber tracks, it has a variable width track frame that can be hydraulically retracted to fit through most doorways and expand with the switch of a lever to obtain sure footing while excavating. A machine this compact expands job opportunities to places where manual labor is traditionally used. Utility companies and plumbers often have to go into yards for waterline, sewer and other utility repairs. This unit will typically satisfy their need to get in through narrow doorways. 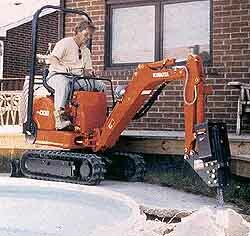 This machine is equipped with enough breakout force to perform tough excavating jobs in between buildings, inside buildings, and in tunnels. The KXB300 hydraulic hammer's compact design matched with the K008 provides formidable breaking power. It's rated in the 100-ft lb. energy class with a frequency range of 900 to 1600 beats per minute. Kubota Tractor Corporation, 3401 Del Amo Blvd., Torrance, CA 90503. Tel: 310-370-3370; Fax: 310-370-3846.